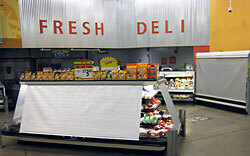 Supermarkets, help keep your perishable food items that are stored in open refrigeration display cases, fresher longer. Econofrost thermal shields keep expensive cold air circulating inside refrigerated display cases during a store's closed hours. For use in all types of cases including: self serve meat cases, packaged deli merchandisers, cold floral rooms, frozen foods aisle cases, produce multi-deck wet racks and dairy and beverage lineups. FACT: Econofrost night covers reduce product waste, save energy and generate a fast pay back period. Over 60% of the supermarket chains and 40% of independents stores across North America are closed on average for 6 to 8 hours at night. By retrofitting night covers to their open refrigeration equipment, these stores could reclaim lost dollars that accrue from inefficient energy consumption and premature spoilage of many perishable products. Deli Manager likes the covers and noted that the packaged salads keep their freshness and color longer. Also said the packaged beans don't have the lids puffing up like they did before Econo-Frost were installed. Econofrost energy saving shields are made of woven aluminum, the most sustainable product of this kind on the market. Econofrost reflective aluminum night covers (which can be used for many other types of food display cases found in convenience shops, food courts and institutional cafeterias etc...) deflect warm ambient heat and light while maintaining the cold air needed inside the case required to keep products cold and fresh. Ideal for use in a variety of departments such as: meat, produce, deli, beverage and dairy, frozen food sections as well as meat prep rooms and service areas, Econofrost does more than save energy. Econofrost night covers lessen the volume of daily trimming and spoiled product, it enables older refrigeration systems to operate with even greater efficiency and it helps reduce global carbon emissions for a healthier planet. All of these benefits provide store owners with a sustainable product that pays for itself within a period less then two years - for some retailers it's just a matter of months! It makes sense to cover or close off open refrigerated displays, to ensure the cold circulating air will stay in; to ensure refrigeration units don't have to work so hard to maintain stable temperatures but instead operate more efficiently allowing perishable foods to stay fresher, longer. And for Econofrost customers, each passing day translates into significant savings and a noticeable difference in the appearance and integrity of fresh foods. Shoppers are more satisfied as the quality and selection from which they can choose from grows. With more product being sold rather than thrown out, stores become more profitable and eco-friendly. Econofrost is quick and easy to install and use, and operates similar to a window shade. Hygienic, it will not rust, or attract dust, mold and mildew and is made of a durable commercial quality food safe and recycleable components that make it safe for in and around the food zone. Even better you can be sure your Econofrost night cover will last through many years of service with little to no maintenace. Made in a variety of sizes, with both retrofit and custom night cover products available, grocery stores and food shops world-wide have the unique opportunity to boost the performance and returns of their open refrigerated display equipment.